Dangerous speeds and courageous dogs on treacherous terrain! Deep inside the Arctic Circle, brave sledders compete in a dangerous race to test their skill and endurance. The snowy course conceals frozen traps, rough terrain, and treacherous corners, and not every team will reach the finish line. Keep a cool head and control your huskies, or you may find yourself smashed into a tree, skidding off the track, or hurtling into an icy abyss. In Snow Tails, each player controls a dog sled with a team of huskies on a break-neck race for the finish line. Use your numbered cards cautiously to slide, slow down or weave through the trees, or go for broke and play the cards that will let you fly ahead at top speed. Keen wits and tactical brilliance will carry you to the finish line without cracking up on the numerous obstacles in your path. 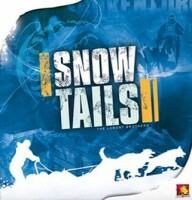 Snow Tails is the game of sled racing over snow-covered courses for two to five players. With sturdy wooden sled teams, 20 wooden saplings, and modular track sections, Snow Tails will have you racing through the frozen wilderness time after time! Dog sled racing game where you have a hand of cards that you draw from your own identical deck as the other players. You play cards to each dog side of your sled and to your brake. There are specific rules for placing cards, but basically you add up the dog cards and subtract the brake cards for your move allowance. The difference in each dog side determines how much drift that you need to take. Drifting is the only way to turn. When certain things occur such as collisions, a “ding” card is taken into your hand, these can never be discarded so you have fewer choices of cards to play. When your hand is filled with ding cards, you are out. I really like this game, the mechanics are fresh and the theme fits. There are many track configurations (tile based tracks). The tiles have various hazards such as saplings which you must avoid, or plow into tearing the tree out of the ground paving the way for all those behind you and there is a promotional tile with a jump. There is a catch up mechanism which theoretically should help to keep the races close, but I have often been smoked by more attentive racers. The potential for AP is there and to address this the game comes with a “big paws” token to be given out to players who take too long (no real game value, but fun nonetheless). When it comes down to it, Snow Tails is really just an exercise in adding and subtracting. An excellent game to play with kids learn these math skills and definitely awesome to start a night of gaming with. I play with a lot of the variants found on BGG and have been meaning to print out my own Jump of Death tile. If you’re a fan of racing and don’t have the need to shoot other players… get this game. 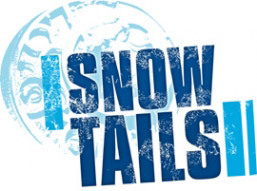 Add a Review for "Snow Tails"